This illustration shows the lettering on a bronze tablet uncovered at Idalion, an ancient city in Cyprus. Idalion (also spelled Idalium) was an ancient city in Cyprus. 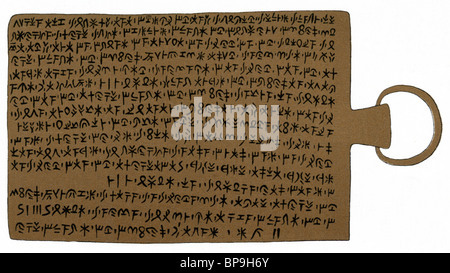 This illustration shows the lettering on a bronze tablet uncovered there. The text is the Cypriot script, a writing system of a syllabic character that was used on the island from between the mid 11th century B.C. to the end of the 2nd century B.C. The text records an agreement between the people of Idalion and a physician and his brothers to care, without charge, for the wounded around 475 B.C.